It was a beautiful place, very cozy, stylish and clean. It was in a very good location, 10 minutes walk from the centre. Nice placement of the apartment. Nice people in the reception. The apartment was as it was on the pictures and with AC. The apartment was great! The exposed brick was wonderful! The apartment was clearly newly renovated and we enjoyed our stay very much! The apartment was about a 10 minute walk from the market square. I love how the apartment was decorated, it was a close walk to the centre. It was cheap and affordable perfect for a few days in krakow! I loved the room it was gorgeous and spacious, looked exactly like the pictures. It was also very warm and cosy, as we went in January it was -7 so it was nice to come back to a well heated room. We have collected the key but it did not work. We had to go back twice, so they gave us beautiful FREE breakfast. We made our own breakfasts and the location was good. The apartment is beautifully decorated, despite the outside of the building not looking like much. Excellent value for money and perfect location. Lock in a great price for Krowoderska Apartments – rated 8.1 by recent guests! One of our best sellers in Krakow! A 15-minute walk from Kraków’s Main Station and the historic quarter, these studios each feature red brick interiors, free Wi-Fi and a kitchenette. There are many restaurants and bars near Krowoderska Apartments. A grocery shop can be found right across the street. The peaceful Park Krakowski is just a 5-minute walk from the hotel, and Wawel Castle is a 5-minute drive away. Theaters, galleries and museums can be found in Krakow’s historic quarter, half a mile away. 뀐 This property is in the real heart of Krakow! When would you like to stay at Krowoderska Apartments? A stylish studio with brickwork elements and wood furniture. Air-conditioned studio with a kitchenette. Spacious studio with a kitchenette. House Rules Krowoderska Apartments takes special requests – add in the next step! Krowoderska Apartments accepts these cards and reserves the right to temporarily hold an amount prior to arrival. Please note that the hotel is located in a limited traffic zone. Guests planning to arrive by car are kindly requested to contact the hotel for more information. Key collection takes place at ul.Gołębia 2. Please inform Krowoderska Apartments of your expected arrival time in advance. You can use the Special Requests box when booking, or contact the property directly using the contact details in your confirmation. We were given the address of where to collect the keys many times, but we needed a map to show this in relation to the apartments. Why were we not told beforehand that this was 2 km away? For us this was a very bad start to our visit. Good location, helpful receptionist, nice room. Key pick up was a bit awkward given we arrived very late and had to make our way from the centre of town back to the property. 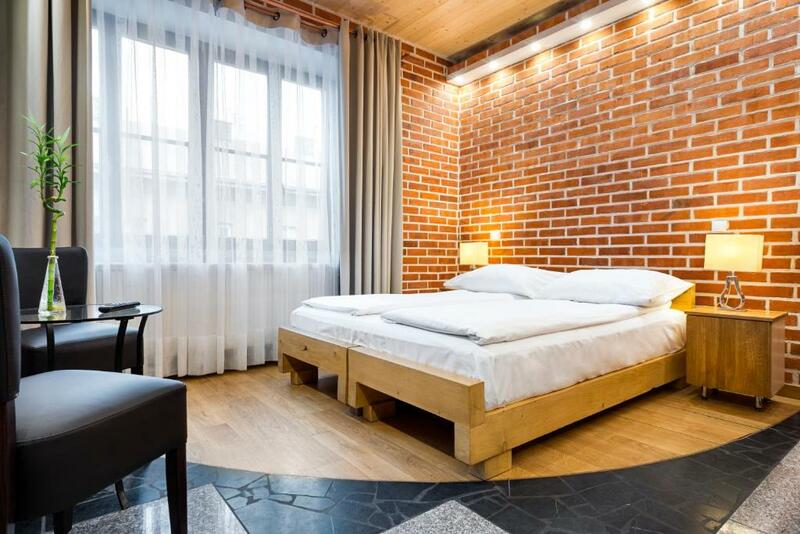 Modern room, within walking distance of the old town and train station. There was a small supermarket located opposite. It needs to be made clearer that you get the keys from a hotel reception, it’s in very small writing at the bottom of the confirmation and doesn’t state the hotel name. You had to pick the keys up from another hotel in a completely different direction to the apartments- not convenient when you’ve been travelling for a long time and have lots of luggage. The apartment was very clean but the floors clearly hadn’t been cleane, it was quite dusty and dirtied our feet and socks. The apartments are across 4 floors in a tall building but there is not one single smoke alarm in the whole building!! The shower in our room only had just enough hot water for one person to get a shower each day. Once one of us had a shower the other had to have a cold one, not what we wanted. Very good facilities. The apartment was very homely and was comfortable. Would definitely recommend to other people! So we went to pick up our keys which was easy to find we got a taxi from the airport to the place we had to pick the keys up.. it’s in the main square! But the lady was quite rude we was greeted very nice we was just told to leave our bags and come back... nothing else which was great but we came back a hour before we was able to check in and the other lady checked for us and our room was ready early so they let us have the keys which was lovely! On our last night we came into our room (10a) and seen orange flames coming up from outside so we went onto our balcony and the weeds and branches up the side of the building/ in the garden was on fire... in this apartment and building there is no fire safety ATALL I read before a came another ladies review about fire safety and I 1000% agree with there needs to be more safety in the building! Even a bloody smoke alarm would be a good start! So I loved the room, the style of the apartments and I loved there was a supermarket straight across the road.. the cleaners came in and changed our towels and was so lovely and kind literally people say it’s a 15 minutes walk to the main square but you just walk up the road and you’re by the main area I LOVE the location as it’s central but quite and out the way at the same time! I would stay here again but there is some cons which makes me think I will look at other places when I return to Kraków! A bit further from the centre then I thought. No lift in the building - not ideal for a heavy luggage. Very clean and great facilities for a longer stay. You need to collect keys at a different place than where the property is located. It was hard to find the room at the property - on the last floor and there was no lift. Less than ideal when you have a heavy suitcase with you. Comfortable bed. Bathroom was ok.